What is in a Forge? I believe that forge & anvil is the best way to fashion a lasting blade. I prefer to make Pattern welded blades, also called Damascus, with metals capable of making very good blades by themselves, not just choosing steels by looks. I would like to announce my second book is now at the editors. Hope to go to the printers in May 2019. Knifemaking 2.0 Advanced Studies in Steel covers topics such as making bloomery steel, mokume, lost wax casting, stabilizing, different folding knife styles, swords, spears, axes, advanced pattern welding ideas, and Wootz the true damascus, and step by step laboratory’s in making ferric chloride & hot bluing chemistry, as well as a section on specialized tooling for the bladesmith shop and more. I am a Blacksmith and Bladesmith. I do not stamp out knives, nor do I have a production line. Its a very personal thing for me. As I am sure it is for you when you make your order with us. I want to feel the steel moving, to smell the coal burning, and I see the blade take its form. Many blades by others are made with special machines stamping out 100's or more identical pieces at a time, or make knives by a process known as 'Stock removal', which is cutting the shape out of metal and grinding until it looks like a knife. This is not quite my idea of the best in knife making. I believe that forge & anvil is the best way to fashion a quality blade. Are you tired of re-sharpening a blade every time you wish to use it because the budget blade won't hold an edge, annoyed at having the exact same blade and handle as everyone else? If you are looking for a quality hand forged knife for hunting, or want a reproduction of an historical piece for reenactment use, one that you would be proud to show off, or even hand forged working sword, you are in the correct place for some of the best in hand made damascus steel. Prices depend on style, size, hardware and exotic woods used. We make custom blades, from simple to complex laminate steel, called pattern welded steel. I use 1095, 1084fg, 1080, 1045, 15N20, L-6, O-1, Wrought Iron, Pure Nickel, and Meteorite for my blades. I have only a few blades for general sale at any given time, as most are made as custom orders, I love making damascus blades, and have produced custom bowie knives, as well as blades for reenactments and hunters to the requested specifications. Feel free to browse the pictures of some of the blades I have made. Only blades made by me here in Fort Wayne Indiana, will have 'Fenris Forge' stamped on them. On my site you will find knives for the camp site, kitchen, even recreation's of blades from earlier times. I make my own damascus billets, and also offer preformed knife blanks that you can finish on your own. 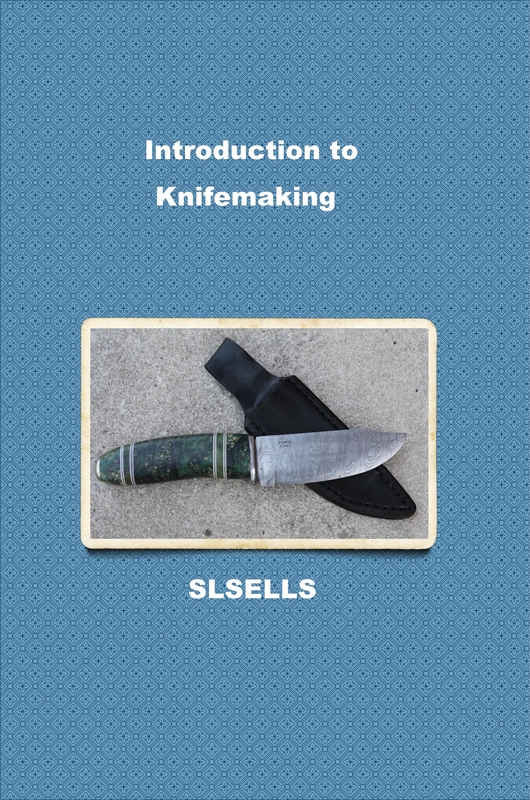 I would like to present my book "Introduction to knifemaking" . The book is in 6x9 inch softbound format with 212 pages and 102 black and white illustrations. Regular retail price is $29.99 plus $7 for Priority postage and handling in the US, for a total of $36.99 delivered in the USA. Hardbound also available for added cost.